This article features a deprecated code proposal. Deprecated Proposals are no longer considered for implementation. This does not necessarily mean that they are completely rejected but for now have been set aside. A proposal/draft specification for the Dialog System's implementation. The Dialog System should be separated logically into two main components: a dialog script interpreter and a graphical dialog box component. The GUI component should handle all input and manage all resources (fonts, images, etc.) used during the course of the dialog. In the mock-up below, three main parts have been specified for the component: a caption, an image area, and the main text/choice area. 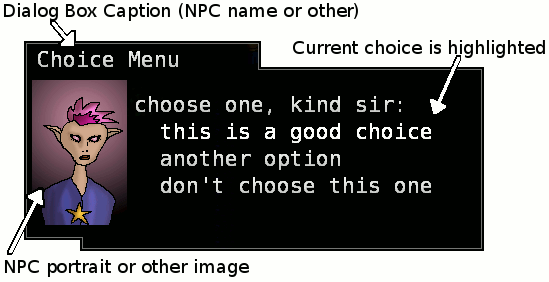 Other parts might include: quick-numbers for choice options (Neverwinter Nights uses these), a graphical indication of whether there is more dialog (such as a small arrow) or whether the end of the dialog text has been reached (such as a small square). Dialog scripts need to allow branching based on direct player choices as well as conditional branching based on other variable states (the world, current quest status, difficulty level, etc.). The following specification for the dialog script format is intended to be trivial to implement/parse and powerful enough to fulfill the story's requirements. Consider the syntax below as a placeholder, though improvements/suggestions are welcome; gaps in functionality are the most important to identify. In the syntax below, for instance, the variable lookup table must either be local to the individual script or global for all scripts (ditto for being transient or persistent) because there is no current method for differentiating between global and local variables. Additionally there is no proposed method for communicating with the core game state beyond the use of preset script variables. Dialog scripts are processed line by line sequentially except where branching occurs. Branches use sections/labels as targets. A section identifier would be enclosed in square brackets:  or [EXIT] for instance.
" denotes a line of dialog text that is passed to the GUI component after interpolating any variables found within it: "Greetings $(PLAYER_NAME)! ^ causes the dialog to be flushed, that is for the current dialog to be displayed and the script execution to halt until an input event advances the dialog. otherwise the dialog flushes whenever it becomes full (the GUI component handles any line wrapping) or whenever a choice section is encountered.
? denotes the text to display for this choice: ? Choice text with a space at the start! The modifying the GUI component or interacting with other delegated tasks (sounds, for instance) can be accomplished either by adding commands to the base dialog script syntax or by using the values of special variables. The advantage of using special variables is that only the controller function (dialog box GUI component, for instance) needs to be updated to check for the variables, the script interpreter remains unchanged (and scripts will still parse correctly, even if a sub-system isn't implemented). Examples of special variables and their use are given below. DBOX_SND, evaluated as a string and used to specify the sound to play when the dialog box is next redrawn. the value is auto automatically cleared and the sound stopped when the dialog box is closed. DBOX_SNDLOOPS, evaluated as an integer and determines how many additional times to play the sound specified by DBOX_SND. a value of 1 plays the sound effect 2 times total. -1 will attempt to loop forever. automatically reset to 0 when closed. This page was last modified on 3 February 2011, at 10:55.